Candidates for municipal offices in Sequoyah County may file their Declarations of Candidacy from 8 a.m. Feb. 6 to 5 p.m. Feb. 8 at the Sequoyah County Election Board in Sallisaw. 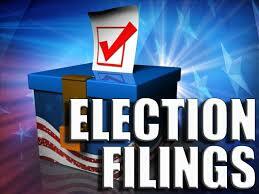 Non-partisan elections will be held April 4 for offices in Gore, Muldrow, Paradise Hills, Roland and Vian. -Vian – Board of Trustees, Seat 2, Board of Trustees, Seat 4 (four-year term) and town clerk/treasurer (four-year term). A North Little Rock, Ark., man was arrested and booked on marijuana and other charges by Muldrow police after being stopped Jan. 28 on Interstate 40 for speeding. Muldrow police reported Deuntay Bennett, age not listed, was found to be driving a rental car when he was stopped by Cpl. Mark Harkins at about 10 p.m. Jan. 28 for speeding. The stop was near the 321 East Exit on Interstate 40. Bennett was also found to have a suspended driver’s license. 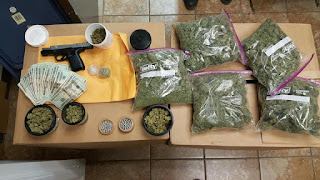 He was taken into custody when the officer found a loaded semi-automatic pistol in the center console of the vehicle, and two and half pounds of marijuana in the trunk. 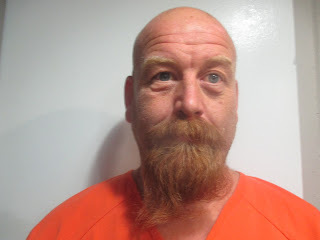 Bennett was booked into the Sequoyah County Detention Center in Sallisaw for speeding, driving under suspension, possession of marijuana with intent to deliver, possession of a firearm during the commission of a felony and the simultaneous possession of drugs and firearms. 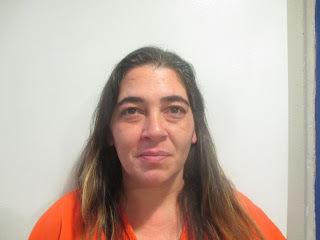 A Sallisaw woman entered a guilty plea to a drug charge in U.S. District Court in Muskogee, and will be sentenced after a pre-sentence investigation. 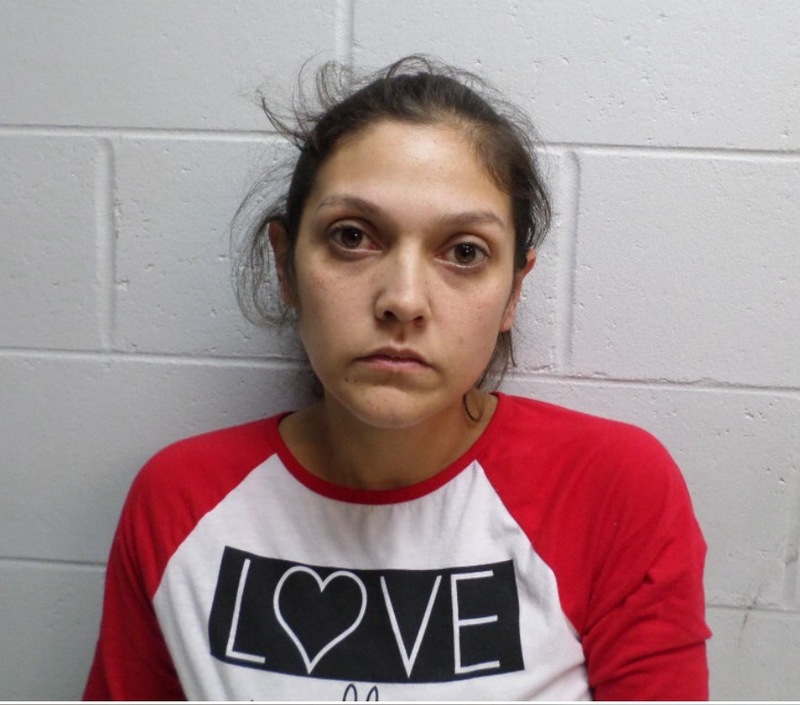 The U.S. attorney’s office reported Amber Luana Small, 25, pleaded guilty to being in possession with intent to distribute methamphetamine. The charge was the result of an investigation by the District 27 Drug Task Force and the Drug Enforcement Administration. The crime is punishable by not less than five years or more than 40 years imprisonment, and up to a $5 million fine or both. The Indictment alleged that on or about Aug. 30 the defendant did knowingly and intentionally possess with intent to distribute 50 grams or more of a mixture or substance containing a detectable amount of methamphetamine, a Schedule II controlled substance. 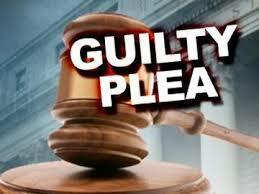 Judge Kimberly E. West accepted the plea and ordered the completion of a pre-sentence investigation report. 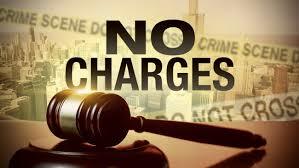 The defendant will remain in custody pending a sentencing hearing. Assistant U.S. Attorney Timothy Hammer represented the United States. 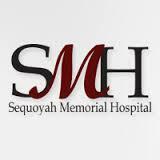 Sequoyah Memorial Hospital, Sallisaw, is offering a reduced rate on calcium scoring screening, a CT scan that can detect calcified plaque in the arteries of the heart. Each Thursday in February the screenings are offered for $99, a savings of over $100. Beth Fair, the hospital’s director of radiology, explained a cardiac CT scan for coronary calcium is a non-invasive way of obtaining information about the presence, location and extent of calcified plaque in the coronary arteries, the vessels that supply oxygen-containing blood to the heart. Calcified plaque results when there is a buildup of fat and other substances under the inner layer of the artery. This material can calcify which signals the presence of atherosclerosis, a disease of the vessel wall, also called coronary artery disease (CAD). People with CAD have an increased risk for heart attacks. In addition, over time, progression of plaque buildup can narrow the arteries or even close off blood flow to the heart. The result may be chest pain, sometimes called angina, or a heart attack. Coronary calcium scans use a special x-ray test called computed tomography (CT) to check for the buildup of calcium. The x-ray technologist begins by positioning the patient on a CT table, usually lying flat on the back. Pillows and cushions may be used to provide increased comfort. Electrodes are placed on the chest to connect the patient to an ECG machine. The table will move in and out of the machine several times, and patients may have to hold their breath from 10 to 20 seconds while images are recorded. The procedure is usually complete in 10 to 15 minutes. Patients are advised to avoid caffeine and smoking for four hours prior to the exam, and to wear comfortable clothing. Every patient and their family physician will be sent a letter with their results. The screenings will be offered from 10 a.m. to 5 p.m. every Thursday in February. 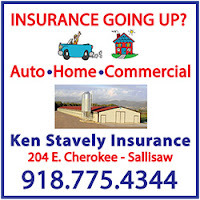 Call 918-774-1119 for set up an appointment. An elderly widower will be able to bury his dead wife on the couple’s property off Bawcom Road, it has been decided, and he will not face criminal charges for improperly disposing of his wife’s body. The man, who was married to his wife for 62 years, was found recently to have buried her in their backyard because the couple did not want to be apart. The man did not know it is a misdemeanor to improperly dispose of or bury a body. The Sequoyah County Sheriff’s Office received a tip about the woman’s death and burial and was required by law to investigate. Sheriff Larry Lane said the state medical examiner’s office has determined the woman died of natural causes. Sequoyah County Commissioners on Monday approved a family cemetery on the property so the woman may be buried near her husband. County commissioners are the agency which approves cemeteries. Lane said no charges will be filed against the man. Sallisaw police have released the names of three suspects arrested during an undercover drug operation Sunday evening in the Walmart parking lot in Sallisaw. Police said when an attempt was made to arrest the suspects, they took off in their car and struck a Sallisaw officer, who fired a shot at the departing vehicle. A short pursuit resulted in the arrest of the three. Arrested were Joshua Lee Rose, 32, of Pocola; Crystal Anne Rose, 33, of Pocola; and Duane Ray Bryant, 30, of Pocola. Joshua Lee Rose was booked into the Sallisaw Jail for trafficking in illegal drugs, using offensive weapon in a felony, carrying firearms after conviction or during probation and conspiracy. Crystal Anne Rose was booked into the Sallisaw Jail for trafficking in illegal drugs, using offensive weapon in a felony and conspiracy. Bryant was booked into the Sallisaw Jail for trafficking in illegal drugs, using offensive weapon in a felony, carrying firearms after conviction or during probation, assault and battery on an officer of the court or witness, endangering others while eluding a police officer, conspiracy and driving while license suspended or revoked. All three have been transferred to the Sequoyah County Detention Center in Sallisaw. Sallisaw Police Captain Jeff Murray said the officer struck by the suspects’ car was treated and released at the local hospital. “He is recovering at home,” Murray said. The officer is Blake Brunk. 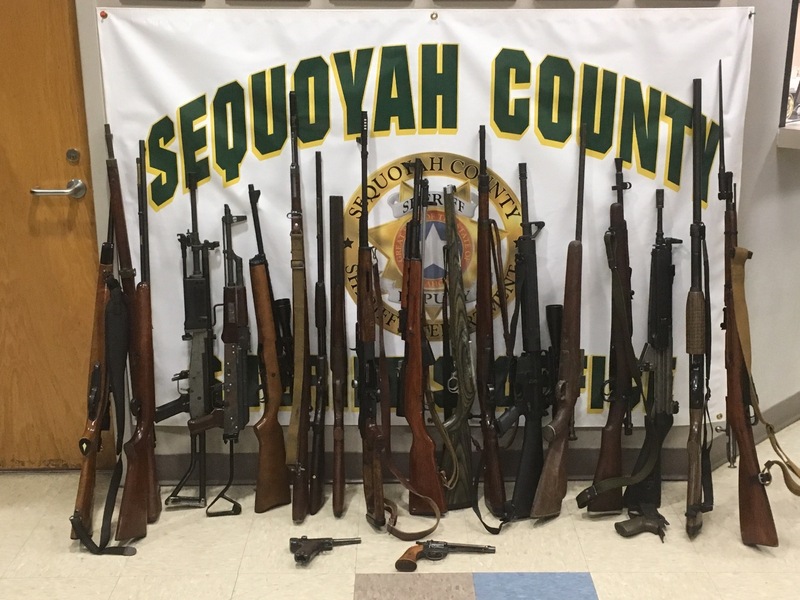 The undercover operation was conducted by Sallisaw Police and the Sequoyah County Sheriff’s Office. It was reported that when the officers showed their badges and tried to arrest the suspects at about 6 p.m. Sunday, they sped off in a Chrysler 300 vehicle. The car hit Brunk in the leg, Murray said. That’s when Brunk and another officer fired at the vehicle. None of the suspects were hit. Murray explained that it is the policy of police departments to put officers who fire their weapons on administrative leave until an investigation determines if the shooting was appropriate. Murray said when the shots were fired the suspects drove off into the field behind Arvest Bank and Dr. Jennifer Scoufus’ office east of the Walmart parking lot. They exited the field between the medical office and Heavenly Imaging where they were arrested, without incident, at gunpoint. Murray said over 28 grams of what is believed to be methamphetamines were confiscated from the vehicle and sent to the Oklahoma State Bureau of Investigation lab in Tahlequah for analysis. Murray said one of the suspects, Bryant, who was driving the car, had injuries to his face that were thought to have occurred as he drove over the curbs at the parking lot when trying to flee from police. The driver’s window was broken and most likely caused the injuries, stated Murray. According to eye witness reports shots were fired in the parking lot of the Sallisaw Walmart at approximately 6:00 pm this evening (Sunday) during what is believed to have been a drug related incident. 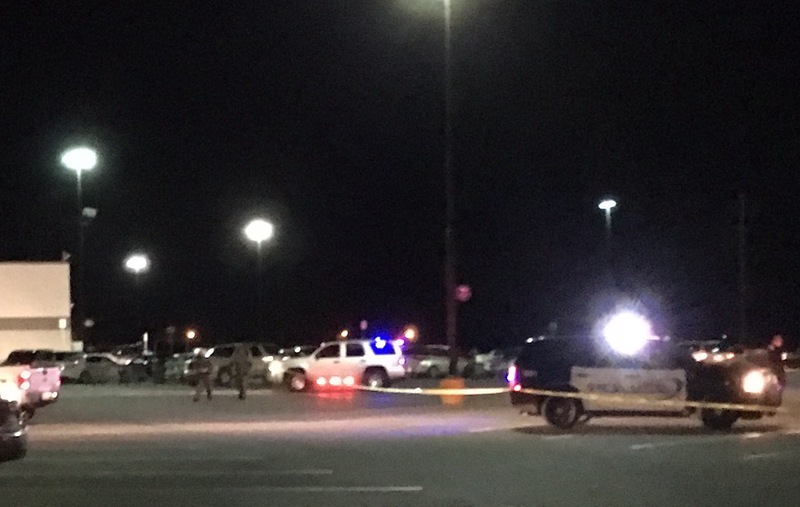 On Sunday evening Sallisaw Police Officers were involved in a drug investigation that led them to the Walmart parking lot. Witnesses initially reported that suspects fired upon the officers who returned fire but that information has now been confirmed to be inaccurate. The suspects struck one officer with a vehicle at which time officers fired upon the suspect's vehicle, according to Sallisaw Police Chief Terry Franklin. The officer was taken to Sequoyah Memorial Hospital to be treated for non-life threatening injuries. 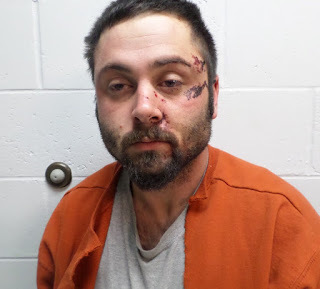 The incident allegedly began in the Walmart parking lot and quickly escalated with suspects fleeing to the parking lot of the Sallisaw Family Medical Clinic where the suspects were placed under arrest. We will bring you more details as they become available later tonight and tomorrow on MixTv Channel 19 News. 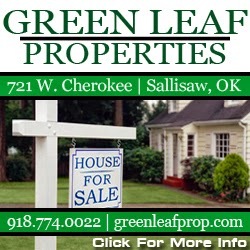 Sallisaw Police Chief Terry Franklin stated, "The Sallisaw Police Dept. 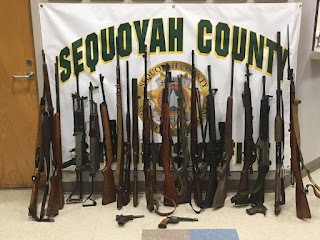 and the Sequoyah County Sheriff's Dept. were conducting an undercover narcotics investigation in the Walmart parking lot. During the investigation one police officer was struck by the suspect's vehicle, at which officers fired at the suspect striking the vehicle." According to Franklin the suspects led officers on a short vehicle pursuit which ended east of Walmart. Three subjects were taken into custody. "The subjects were not struck by any of the rounds fired," added Franklin. The police officer that was struck by the suspect's vehicle was transported to an area hospital with non-life threatening injuries. Teen Dating Violence Awareness Month kicks off Jan. 30. In Sequoyah County the events are sponsored by the Coordinated Community Response/Sexual Assault Response Team (CCR/SART). On Jan. 30 the CCR/SART team will ask Sequoyah County Commissioners to sign a proclamation declaring February as Teen Dating Violence Awareness Month to coincide with the national campaign. Timmerman said CCR/SART members will hold assemblies at schools throughout the county during the first week of February to make students aware and educate students on dating violence. The CCR/SART’s second annual chili cook off fundraiser will be held from 11 a.m. to 2 p.m. on Feb. 18 at the Sequoyah County Fairgrounds. The cook off is open to all teams and there is no entry fee. A $5 fee will be charged at the front door for tasting kits, which includes voting tickets for the best chili, best dessert and best presentation. Awards will be presented at the close of the cook off. The teams are responsible for their own cookers, extension cords, etc. A 42-year-old Spiro man, after he was stopped for a traffic violation south of Sallisaw on U.S. Highway 59 at the Arkansas River, was arrested after over 30 grams of suspected methamphetamines and an unlisted amount of marijuana were found in his vehicle. 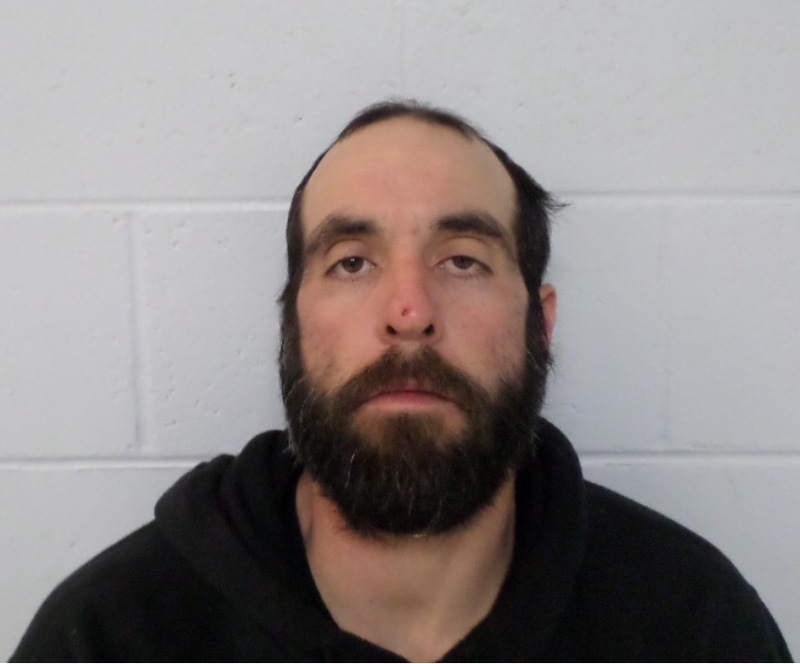 Jason Oscar Linebarger was booked into the Sequoyah County Jail in Sallisaw shortly after 6 p.m. Tuesday for trafficking in illegal drugs, driving with a suspended license and possession of a controlled substance. He was released on a $25,000 bond on Wednesday. He is due to appear in Sequoyah County District Court in Sallisaw on Feb. 1 to answer the charges. Linebarger was already free on a $10,000 bond for a conspiracy charge in Sequoyah County District Court. In district court, Linebarger has been found guilty on four other felony charges and two misdemeanors, Sheriff Larry Lane pointed out. 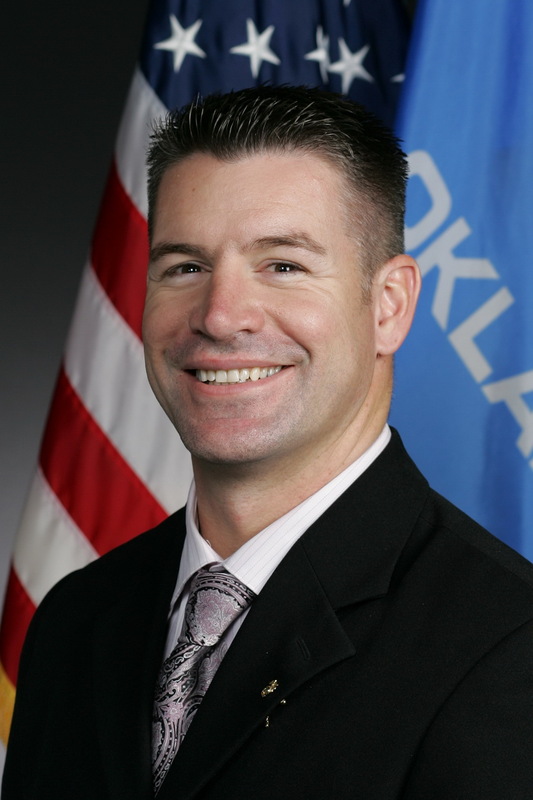 State Reps. John Bennett (R-Sallisaw) and other legislators have met with law enforcement leaders about their budget needs for this year and the future. Bennett, Mark Lepak (R-Claremore), Bobby Cleveland (R-Slaughterville) and Greg Babinec (R-Cushing) have, over the past two weeks, met with a number of state law enforcement agencies regarding their budget needs. Bennet is the chair of the House Appropriations & Budget Public Safety Subcommittee. Cleveland is the chair of the House Public Safety Committee and Babinec is the vice chair. Both serve on the A&B Public Safety Subcommittee. Lepak is the vice chair of the A&B Public Safety Subcommittee and serves as a member of the standing House Public Safety Committee. Bennett said the agency heads will be presenting their budget needs to the full subcommittee in the coming weeks. “Due to the revenue shortfall we need to ensure that we as legislators are being good stewards of the tax payer dollars, at the same time ensuring we prioritize the money the agencies need to ensure public safety for our citizens,” Bennet said. Agency heads in the recent meetings were asked what effect a 5 percent, 7.5 percent and 10 percent cut would do to their agencies and their ability to provide public safety. Lawmakers also asked what cost-saving measures have been implemented thus far by the agencies and what their plans are for the future. Agencies represented in the budget meetings were: the Oklahoma Highway Patrol, the Oklahoma State Bureau of Investigation, the Oklahoma Bureau of Narcotics and Dangerous Drugs Control, the state Medical Examiner’s office, the Oklahoma Council on Law Enforcement Education and Training, the Oklahoma Alcoholic Beverage Laws Enforcement Commission, the state Fire Marshall and the Oklahoma Department of Corrections. A Muldrow woman was arrested and her pit bull shot by a police officer after the officer was attacked by both the woman and the dog. Muldrow Police Chief George Lawson said police received a call about a domestic argument between a man and woman at 505 Will Morgan Rd. in Muldrow on Tuesday evening. When sent to investigate, Officer Brad Roberts was getting out of his car when two pit bull dogs came from the house and ran to attack Roberts. Lawson said it is unclear if the dogs were turned loose or escaped from the house through unsecured doors. The owners were cited recently for allowing the dogs to run loose, he added. Roberts shot the dog in self-defense. It survived and both dogs ran off. They returned home the next day, police were told by the owner, Stephanie Oldham, 38. But Oldham appeared angered and hit Roberts in the chest, Lawson said. In the meantime he had called for assistance and other officers realized they had a search warrant for that residence, Lawson said. Robert Allen had obtained a search warrant for a clandestine lab earlier in the day. The officers went to assist Roberts and served the warrant at the same time. “They found several items consistent with the manufacture of methamphetamines and found paraphernalia,” Lawson said. Oldham was booked into the Sequoyah County Jail on two counts of endeavoring to manufacture, unlawful possession of paraphernalia, and assault on a police officer. Her bond was set at $30,000 and she was released Tuesday. Lawson said the original call for a domestic turned out to be between Oldham and her brother. An arrest warrant was requested for the brother’s arrest on Thursday. Friday near Gore. Four suspects were arrested during the investigation. Four suspects were arrested Friday during a drug investigation near Gore. Arrested were Mark Duane Matthews, 51, of Gore; Nathen Lee Ellis, 32, of Sallisaw; Teresa Ann Bateman, 39, of Sallisaw; and Athena Nicole Moreno, 19, no address listed. Sequoyah County Sheriff Larry Lane said officers with the sheriff’s office, the Sallisaw Police Department, the District 27 Drug Task Force and the Oklahoma Highway Patrol served a narcotics search warrant at the home of Matthews, one and a half miles north of Gore on State Highway 100, Friday morning and found a small amount of marijuana, prescription drugs which tested as hydrocodone, and 22 guns of various kinds. 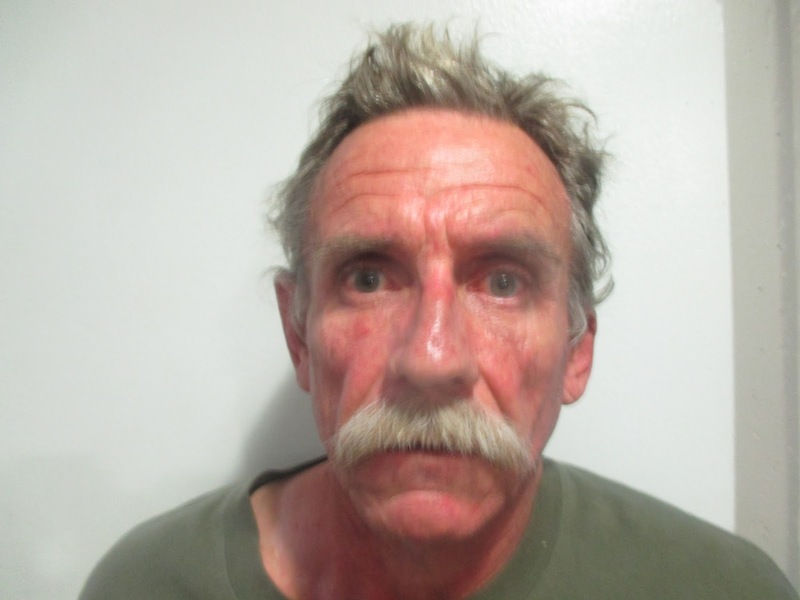 Chief Deputy Charles House said investigators suspected there were methamphetamines in the house, but when they entered the home, the alleged methamphetamines had been flushed down the toilet. 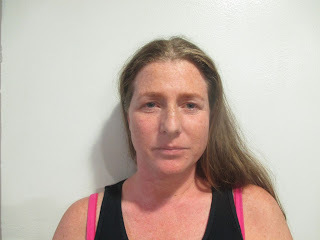 Bateman and her daughter, Moreno, were arrested in the residence and Ellis drove up while officers were at the scene. House said methamphetamines and a methamphetamine smoking pipe were found in Ellis’ pickup truck and he was also arrested. Matthews was booked into the Sequoyah County Jail in Sallisaw for distribution of a controlled dangerous substance and possession with intent to distribute, unlawful possession of paraphernalia, possession of a firearm with an altered identification during commission of a felony and conspiracy to commit a felony. He was released Friday on a $10,000 bond. Bateman was booked into the county jail for possession of a controlled substance, possession of a firearm with an altered identification during commission of a felony, unlawful possession of paraphernalia, possession of a controlled dangerous substance without a tax stamp, and possession of a controlled substance. Her bond was set at $22,000 and she was reported still in jail on Thursday. Moreno was booked for possession of a controlled substance, unlawful possession of paraphernalia and possession of a firearm with altered identification during commission of a felony. 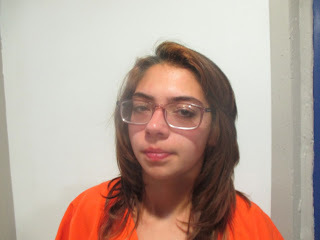 She was released on a $5,000 bond last Friday. Ellis was booked for possession of a controlled substance and unlawful possession of paraphernalia. He was released last Friday on a $5,000 bond. The dirt work for a 40-foot by 40-foot storage building for Catholic Charities Helping Center in Sallisaw will be constructed just west of the Helping Center at 409 N. Adams. It is hoped about $10,000 can be raised to complete the project. Catholic Charities Helping Center in Sallisaw feeds and clothes the hungry, helps the homeless find shelter, and helps those in need in many ways. Now the community can help the Helping Center. Housed in an older building at 409 N. Adams St. in Sallisaw, the Helping Center often runs out of room to store foods, clothing, household items, all those things needed by the needy. The Helping Center team is limited due to a lack of storage space. But help is on the way. 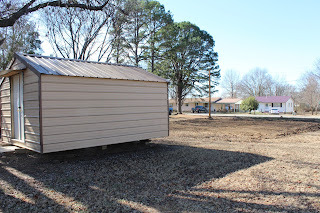 A group has stepped forward to sponsor a building project for a 40-foot by 40-foot storage building to be constructed on the empty lot next to the Helping Center. Some donations have already been made. Labor and a reduced price on building materials have already been donated, along with about $6,000. The total cost for the new building is expected to be $20,000, said MaryLynn Lufkin, Helping Center director. Dirt work has also begun. Any donation will be appreciated, Lufkin said. “This is God’s answer to our prayers,” said Lufkin, who is excited about the project. In the past, when donations overfilled the Helping Centers storage area, donations had to be turned away. With increased storage, the Helping Center will be able to help even more, Lufkin said. Donations to help with the building project may be sent to Catholic Charities, P.O. Box 1321, Sallisaw, Okla. 74955. Or they may be dropped off at 409 N. Adams in Sallisaw between 8:30 a.m. and 3 p.m. Monday through Thursday. The building campaign is sponsored by The Mix 105.1, Giant Door Media and Journey Church. George Glenn, former Sallisaw mayor, chamber member, and retired insurance agent, was awarded a lifetime achievement award at the Sallisaw Chamber of Commerce Membership Luncheon Wednesday. At the presentation are, from the left, Randall Baker, Glenn’s son-in-law; Kylie, his granddaughter; Tracy Baker, his daughter; Glenn; and Buddy Spencer who presented the award. Mike Neer, who recently retired from National Bank of Sallisaw, was awarded a lifetime achievement award at the Sallisaw Chamber of Commerce Membership Luncheon Wednesday. Gary Schaefer presented the award. At the presentation are, from the left, Schaefer, and Mike and Gloria Neer. Neer helped with the finances for the chamber and the Sallisaw Improvement Corporation, where he served on the board for over 10 years. 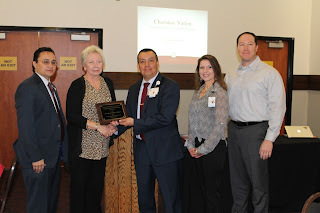 The Cherokee Casino Sallisaw was named the Sallisaw Chamber of Commerce Member of the Month for January at the chamber’s membership luncheon at the casino on Wednesday. At the presentation are, from the left, Chuck Hoskin Jr., Cherokee Nation Secretary of State; Chamber President Cheryl Mills, chamber president; Rod Fourkiller and Amber Nelson who represented the casino; and Bryan Warner, Cherokee Nation District 6 tribal councilman. Chuck Hoskin Jr., Cherokee Nation Secretary of State, was the guest speaker at the Sallisaw Chamber of Commerce Membership Luncheon on Wednesday. He spoke on the impact of the tribe on the community. Lifetime Achievement Awards were presented to George Glenn and Mike Neer at the Sallisaw Chamber of Commerce Membership Luncheon Wednesday. The luncheon was held at the Cherokee Nation Casino in Sallisaw. 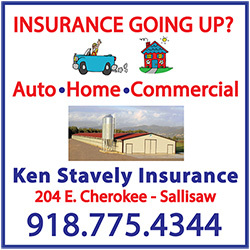 Buddy Spencer presented the award to Glenn, who recently retired from his career as an insurance agent. Spencer recalled that Glenn was mayor of Sallisaw for 25 years. “It would take two weeks to tell all about him, not two minutes,” Spencer quipped. 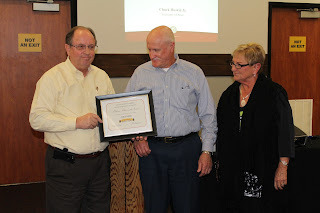 Gary Schaefer presented the award to Neer, who recently retired after 31 years with National Bank of Sallisaw. “He always worked to bring a better way of life to the community,” Schaefer said about Neer. The Chamber Member of the Month was the Cherokee Casino Sallisaw. Rod Fourkiller, Amber Nelson, Brian Warner and Chuck Hoskin Jr. accepted the award. Hoskin, Cherokee Nation Secretary of State, was the speaker at the meeting. He gave a short review of Cherokee Nation history and pointed out the nation has a huge impact on the area. 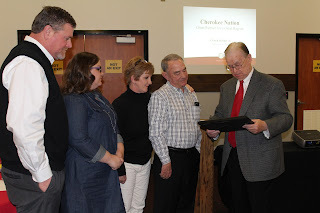 “The Cherokee Nation is a story of grit and determination” Hoskin said. 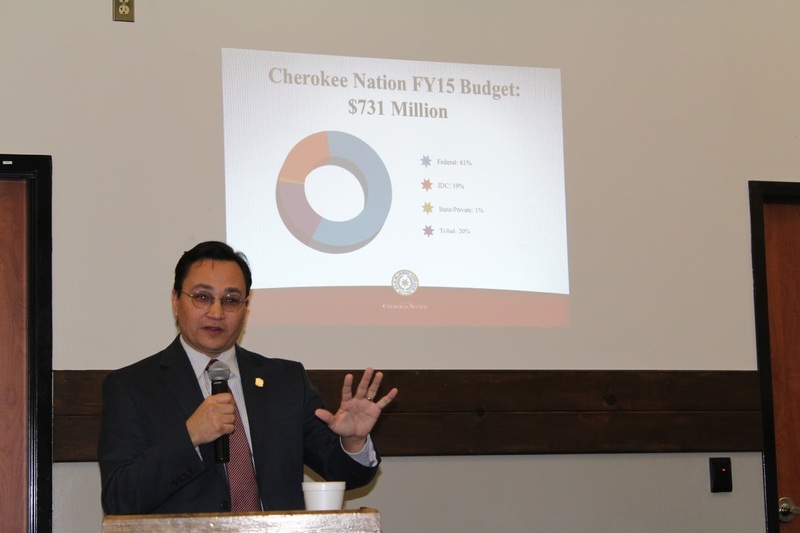 Hoskin pointed out that the Cherokee Nation has a $117 million impact in Sequoyah County alone, with over 1,000 jobs, and a total budget of $731 million in the tribe’s 14-county area for 2017. He said 1,600 people in the county get housing assistance, the tribe has spent $500,000 on infrastructure and over 500 students have received scholarships. Hoskin pointed out that the Cherokee Nation now owns the Sequoyah’s Cabin historic site in Sequoyah County, which is currently closed for improvements. The site will re-open in March, he said. Chamber President Cheryl Mills announced that the annual Chamber Recognition Banquet will be held Feb. 18 at the Sallisaw Middle School. Mike Mass will be the guest speaker. A former state representative from Hartshorne, Mass spent two years in prison for taking kickbacks. He has written a book, “Beneath the Vines,” about his life. It was also announced that the March of Dimes March for Babies Kick Off will be at noon Thursday at the People Inc. Training Center. A funding campaign for a storage building for Catholic Charities Helping Center in Sallisaw is also underway.